All that splattered on, cooked on food can come off in seconds without you scrubbing! It’s true! Simply do this one thing — fill a microwave-safe bowl halfway with water and add a tablespoon of vinegar. Cook on high for 5 minutes. The steam loosens built-up residue and with a quick swipe of your washcloth it will be gone! It is truly a miracle! 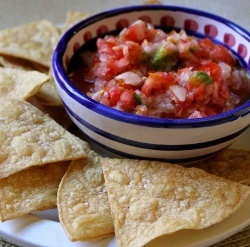 Homemade Tomato Salsa in 5 minutes! When I need a quick last minute item to take to a picnic or have someone coming over unexpectedly, this is a quick recipe I use. Warm 1 Tbsp. olive oil in a large skillet over medium heat. Add diced medium onion and saute until translucent, about 5 minutes. Add chopped garlic clove and saute 1 minute more. Transfer to a bowl and allow to cool. In a medium bowl, combine 2 large chopped tomatoes, onion mixture, 2 Tbsp. fresh lime juice, 2 tsp. chopped fresh cilantro (optional), and 1/8 tsp (or a bit more to taste) each chili powder, garlic powder, salt and pepper. Healthier chips ~ Choose a brand of chips with no more than 150 calories per ounce, no more than 150 milligrams of sodium and at least 2 grams of fiber. Also look for trans-fat free and with fewer than 8 grams of fat in total. Ever wonder why some people can make the best cookies and others, well..let’s say it’s not their forte’? There are a few very simple techniques to ruing out the best homemade cookies. Start with a good tried and true recipe, that’s easy enough. Perfect Homemade Cookie Tip #1 — Measure, measure, measure. The most important starting point is to be precise with measuring the ingredients. Perfect Homemade Cookies Tip #2 — Never overmix. 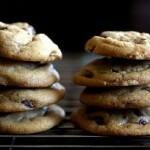 Overmixing cookies encourages gluten development. Basically, the more you mix the tougher and more elastic the dough becomes making it very dense & heavy. Perfect Homemade Cookies Tip #3 — Do not overbake. Know your ovens true temperature by using an oven thermometer (I leave one in my oven). And then watch the cookies for precise timing for removing from the oven. Take them out just prior to what you feel is “done” they will continue to slightly cook while cooling. Mix softened butter and sugar for several minutes, until very light and fluffy. 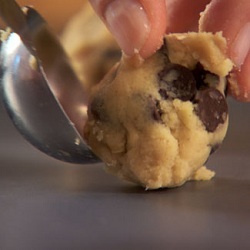 This makes the cookies melt-in-your-mouth perfect! Now it’s time to make cookies! Put the egg to a test and find out if it is uncooked or hard-boiled. Spin it on a flat surface. If the egg wobbles, it’s fresh because the insides are moving around. If the egg spins smoothly, it’s cooked.